The temptation may be to cover a lot of miles and pack a lot in (literally!). But remember that once you’ve collected your hired campervan the enjoyment is in the journey, not the destination. So try to take it more s-l-o-w-l-y than you would in a car, particularly if you’ve hired a vintage camper or motorhome. Relax, take it easy and enjoy the novelty of the ride. The driving experience is different for starters. While modern campervans will feel similar to a (heavy) car, vintage campers are a different story altogether and you’ll need to treat them gently. The lack of power steering and engine power will often dictate your pace of driving anyway, while you’ll have to use side mirrors much more frequently and will need to get used to parking! 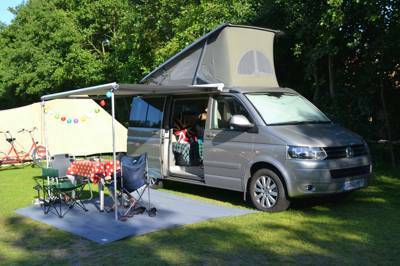 But, blind spots and nervousness can be overcome by hiring a campervan with front and rear parking sensors, common on the VW California and most motorhomes. A final tip is to park well away from others and also seek out car parks with larger spaces for motorhomes. So you’ve picked up your camper and tootled along, soaking up the experience. But where to camp? If you’re holidaying in a quieter month then you can probably afford to be spontaneous and just pitch up at your chosen campsite. In peak times or popular places, however, it’s advisable to book ahead to avoid turning up after a long drive to find the site’s already full. You can book campsites on Cool Camping, of course, or browse all campsites from the home page and give them a ring in advance. For those used to camping under canvas, camper vans are much quicker and easier to set up: just make sure you select a flat pitch (avoiding wet or boggy grass) and choose one with an electric hook-up only if you intend to plug in 240v appliances such as kettles and heaters. Just raise the roof, wind out the awning, put the kettle on – et voila! Do I need to stay on a campsite? It’s a fairly common question for first time campers. While in theory the self-sufficiency of a campervan means you could ‘wild camp’, in practice it’s advisable to stay at campsites for two main reasons. First, choosing a spot just off a road will lack essentials such as electricity, toilets, hot showers and washing-up facilities, and may potentially be unsafe. Is this really the experience you want and is it really worth the £20 you’ll save? Secondly, so-called wild camping in densely-populated Blighty is difficult and actually illegal in England and Wales. Scotland’s Outdoor Access Code is widely misinterpreted, since it doesn’t apply to motorised vehicles, so in Scotland too, wild camping in campervans is technically prohibited. However, in remoter spots such as beach and countryside car parks informal camping is sometimes tolerated across the UK as long as you use common sense. This means obeying signs and bylaws, parking away from others, considering the cumulative impact of wild camping on local habitats, taking all waste away with you and never staying more than a night or two. Wherever you choose to camp, make sure you leave no trace and respect other campers and local residents. Cooking is great fun in campervans. But with only two rings (plus a fridge and water on tap) you’ll need to be inventive with your meal planning! Quick-cooking meals involving pasta, couscous and chilli are staples, matched with ingredients such as pesto, chorizo, fresh seafood and herbs to provide that extra zing. There are plenty of purposefully practical ideas in the Cool Camping Cookbook or Josh Sutton's book Guyrope Gourmet. When it comes to smelly foods such as fry-ups and kippers, my advice is to cook these outside on a barbeque or small stove – it took several days for the odour of fried kippers to disappear from our brand new VW California! While younger children can go to bed at their normal time in a larger motorhome or campervan with a pop-top roof (given separate sleeping areas), many families may find that it’s easiest just to share the same bedtime. Older kids tend to play outside until the usual 10pm campsite ‘quiet time’ in summer anyway, and it’s not worth fighting for an earlier bedtime. You are on holiday after all. When it’s time for bed you’ll quickly learn that organisation pays dividends. From several years’ practice, our ‘system’ is this: At night, pack the family off to the wash block en masse and get some much-needed space to make up the beds. In the morning, the earliest riser gets washed first, then packs up the beds and makes a start on breakfast. It may sound regimented but it works with the minimum of fuss – you try cooking breakfast when half the family’s having a lie in! Similarly, it pays to think ahead about your belongings and pack wisely. Leave those hard suitcases at home and take soft bags (packing cubes are great for compressing clothes). Give everyone their own storage space and find a designated place for everything to save arguments. Clearly, there’ll be less storage than you would expect in a typical hotel room or apartment so packing lightly is essential. Do you really need four pairs of shoes? How often will those smart clothes be worn? Inevitably, though, you’ll want to take along bikes, dogs, kayaks and other paraphernalia. Your camper van hire company should be able to provide bike racks and roof bars at an additional cost, and a driveaway awning is well worth considering if you plan to be on a campsite for more than a couple of nights. Awnings will give you that extra space for relaxing, for a dog and for storing your gear, keeping things safe when you’re off site. – Pace yourselves: choose an itinerary that allows for meandering – particularly if you’re hiring a vintage camper. – Take it easy on the first day while you get used to the driving style. – Book campsites in advance, especially if you’re travelling at peak times. – Plan a few ‘staple’ meals before you leave – and take small containers of those essentials (such as spices, olive oil and parmesan) from home. – Travel light: leave suitcases at home and take smaller, soft bags. Be aware that storage can sometimes be limited. Read part one of our campervan hire guide or, if you've been inspired and just want to hit the road, you can view a wide range of campervan hire companies now. See you out there! Ewan Mearns is an experienced camper, backpacker and campervan owner with a passion for exploring the outdoors. You can find many more insights and tips at his blog, WildaboutScotland.com.